Leadership Summit presenters include a cross section of education leaders from across the country. Each year SETDA strives to include a variety of speakers including representatives from the White House, U.S. Department of Education, a variety of State Departments of Education, national education organizations, school administrators, teachers and students. Berj Akian founded ClassLink in 1998. What started as an effort to help one local school with their technology plan became ClassLink. Today ClassLink serves students and teachers around the world. Berj has been a panelist, presenter, and moderator at hundreds of conferences and webinars with industry experts on various aspects of education technology. His ongoing work with school and industry leaders for almost two decades gives him a front row seat on technology in the learning process and the use of data to improve learning outcomes. He has authored many articles for industry journals and has judged many education and technology industry award programs. Dr. Ballard has extensive and varied experience in leading and moving the work of large multi-agency projects and steering teams forward. She is actively leading six prominent steering teams including: Educator Equity Steering Team, Certified Personnel Evaluation System and Leader Accountability Advisory Panel, Wyoming Career Readiness Council, Virtual Education Advisory Committee, Statewide Digital Learning Advisory Panel, and Computer Science Education Task Force. Previously, Previously, Dr. Ballard has previously successfully led or facilitated the Distance Education Task Force, P20W Statewide Longitudinal Data System Governance, Wyoming Summer School Advisory Team, and Accountability Steering Team. These steering teams and advisory panels include a diverse set of stakeholders including state legislators, Governor’s Office, industry, multiple state agencies, school district superintendents, school district technology directors, and virtual education providers. Laurel also represents the Superintendent of Public Instruction on Wyoming’s Workforce Development Council. Jennifer Bergland has long been an advocate for the use of technology to transform teaching and learning. She has lobbied for the digitization of the education process at the local, state, and national level. She has testified before both the Texas House and Senate education committees and spoken at a briefing on Capitol Hill in Washington DC promoting the one-to-one laptop-project that she directed while she was the Chief Technology Officer at Bryan Independent School District. ISTE awarded Jennifer the Advocate Trendsetter Award (2009) and the Making It Happen Award (2015). After retiring from public education in June of 2010, after 32 years of service as a teacher and a technology director, she became the Director of Government Relations for the Texas Computer Education Association. This has enabled her to focus on three of her passions: education, technology, and the political process. John Branam is passionate about the transformative power of learning. He has a fervent commitment to improving outcomes for kids – especially students of color, and students from challenging backgrounds. He is currently the Executive Director of the Sprint 1Million Project: a nine-year effort to help close America’s “Homework Gap” for 1 million high school students who do not have access to the internet at home. In year one the 1Million Project is distributing 180,000 devices to students in 1,352 high schools in 118 school districts in 30 states. John lives SVP’s Values and Behaviors, bringing data-driven decision making with research, breakthrough innovations, and Big Hairy Audacious Goals. John has two young children and loves to travel with them as a family. His wife is the Executive Director of Prosper Portland, and they spend lots of time thinking and talking about the intersections of education, economic development, and public policy. Launching year one of the 1Million Project is an enormous undertaking, so John works —a lot—while also doing his best to be a present father and husband. Dr. Susan M. Clair is the Learning Infrastructure Coordinator for the Virginia Department of Education (VDOE). She has over a decade of experience as a former Director of Instructional Technology. Virginia does not view the E-rate program in isolation but rather has a larger vision of how infrastructure supports learning in schools. With that vision in mind, The K-12 Learning Infrastructure Program (KLIP was created. Susan’s role is to build this program into a major resource for educators. The KLIP is a partnership with the VDOE, the governor’s office, and the EducationSuperHighway. The goals of the program are to get fiber to schools that need it, ensure classrooms have updated and reliable Wi-Fi, help schools get more broadband for their budgets, and assist schools with the E-rate process. Since 2016, the KLIP has assisted school divisions with their infrastructure by developing state master contracts for broadband and network equipment, making state matching funds available for self-provisioning broadband networks, and providing the support, industry expertise, and information that schools need to make informed decisions. Cynthia Curry is Co-Director of the National Center on Accessible Educational Materials for Learning (AEM Center), a technical assistance center funded by the Office of Special Education Programs at the U.S. Department of Education. In this capacity, she works with stakeholders across preK-12, higher education, and workforce development to ensure that all learners have the same access to high-quality accessible materials and technologies for learning. A significant area of the Center’s work is to build the capacity of a cohort of states to develop scalable expertise and replicable implementation approaches for the procurement and provision of accessible materials and technologies. My name is Emma Davis and I am 14 years old. I live in Sandy, UT, just south of Salt Lake City. I’m in 9th grade and I started at Mountain Heights Academy in 7th grade, partially because I participate in a competitive swim team and a tramp and tumbling team. I like Mountain Heights because it is more flexible for my schedule. I can do more with my time and I can do it anywhere with WiFi. André DeLeón is an Education Programs Professional for the Nevada Department of Education. As a member of the Standards and Instructional Support (SIS) team, responsibilities focus on K-12 science education and instructional materials for the state of Nevada. Professional experience includes over 25 years as a teacher, school administrator and school board member as well as work as a research sociologist and youth-at-risk counselor. Melinda Fiscus is happy to be spending her eighteenth year with The Learning Technology Centers of Illinois. In this role she provides networking opportunities, consulting services, professional development for school districts, and advocates for the advancement of educational technology across Illinois. She also serves as one of the Illinois representatives to SETDA, serving on the Professional Learning committee. She is one of the Illinois State E-rate Coordinators (SECA), and serves on the Classroom Connectivity Project and ICN Advanced Engineering Task force. Melinda is proud to be an alumni of University of Illinois Springfield, and has successfully implemented several grants to support districts in the southern Illinois area. She is currently excited about helping with the adoption of Open Educational Resources (#GoOpen), the Future Ready School Initiative, and is passionate about creating immersive learning experiences for staff and students. As Managing Director of ETIN, Bridget helps companies better understand the education market so that they can grow their brands worldwide. She has held key leadership positions at companies including: PolyVision, Key Curriculum, SchoolNet, PLATO Learning and as the Executive Director of the California Learning Resource Network, a service of the California Department of Education. She has served on the SIIA Board, E-Learning Workgroup, Office of the Secretary of Education, and the Technology Advisory Group, Office of the Governor of California. She has been a guest lecturer for university education programs and holds credentials in English, science, mathematics and school administration. Lora Gibbons received her BS from Brigham Young University in Biology Composite Teaching, with a minor in Physical Education and Coaching. Lora’s experience includes teaching Eighth Grade Science, Biology, Physical Science, Ecology, and Anatomy and Physiology in Tennessee and Utah. Lora is the Mountain Heights Academy 2017 Teacher of the Year and the eCybermission team she advised placed second in the state. She is bilingual in Spanish and she loves teaching. Lora regularly volunteers in her children’s elementary classes to teach hands-on science. Theresa Gibson is the Professional Learning & Leadership Collaborative Program Manager at the Friday Institute for Educational Innovation at North Carolina State University. Since 2014 she has managed the development, implementation, and facilitation of the Friday Institute’s vertically aligned professional learning programs to support the transition to personalized learning for Superintendents, District Teams, School Level Administrators, Instructional Coaches, Instructional Technology Facilitators, Media Coordinators, and Teacher Leaders. Theresa also supports the implementation of the Friday Institute’s national Leadership in Blended and Digital Learning Program which has been implemented in 15 states and 19 organizations. In North Carolina she supports the the Friday Institute’s statewide professional learning programs as part of the implementation of North Carolina’s Digital Learning Initiative. Theresa plays a key role in the business development, sustainability, evaluation, and continuous improvement. Drawing on her experience as a mathematics educator, Theresa is also a course developer for the Fraction Foundations and Teaching Statistics Through Data Investigations, and Teaching Mathematics through technology MOOC-Ed teams. In addition to her contribution as a course developer Theresa authored 8 micro-credentials that align with the Fraction Foundations course and contributes to the scoring and validation of the Institute’s micro-credentials on myriad topics. Theresa earned her B.S. in Mathematics and in Mathematics Education at Buffalo State College in NY and will complete her MBA with a certificate in Decision Analytics in December 2017 at North Carolina State University. Dr. Bradley C. Landis joined the Montgomery County Intermediate Unit in Norristown, Pennsylvania in October 2012, as the Assistant Executive Director. In this role, he provides leadership to all of the offices of the MCIU and works directly with school districts and nonpublic schools to develop services that support best practices in curriculum, instruction and professional development. Dr. Landis has worked in public education for 32 years, serving in a variety of roles including Special Education Teacher, Elementary Teacher, Elementary Principal, Director of Technology, Assistant Superintendent and Superintendent. Before arriving at the MCIU, Dr. Landis served as Superintendent of Schools for the Pottsgrove School District. Prior to being named Superintendent in 2007, Dr. Landis worked for two years as the Assistant Superintendent of Curriculum/Staff Development and Technology for the Pottsgrove School District. Dr. Landis has served as a board member of a nonpublic school for nine years, Christopher Dock High School – the final three years as board president. Kate Larson, 14, is from Cedar Hills, Utah and has been attending Mountain Heights Academy for three years. She is a National Junior Honor Society member, the president of the STEM Club, and has received the President’s Volunteer Service Award. In 2016, she and her team placed second in the state in the e-cybermission science contest. Jennifer (Jen) Leasure is the President and CEO of The Quilt – a consortium of the country’s advanced regional networking organizations supporting research and education (R&E). Formerly the Program Manager for The Quilt, Jen helped shape the strategic direction of the organization through developing and supporting programs of strategic importance to members and expanding outreach to the R&E community. Prior to joining The Quilt, Jen spent more than 15 years in increasingly senior positions in the telecommunications and healthcare industries, including in the role of Director of Customer Operations for a commercial internet provider. Jen has extensive experience in operational management, organizational optimization, and development of partner relationships. She has designed and implemented operational improvement initiatives including automation, organizational design and process improvement across all areas of operations for broadband, telecommunications and healthcare companies. She holds a Bachelor of Arts degree in Economics from Colorado State University and a Master in Arts in Microeconomics from the University of New Mexico. With over two decades of policy and legal experience, Reg advises national education associations, state education agencies, school districts, nonprofit leaders, and companies about federal education, student data privacy, and technology law. He counsels a wide range of entities about how to work effectively with Congress, the U.S. Department of Education, and the Federal Communications Commission, and frequently speaks and writes about emerging policy and legal issues in education reform. Prior to co-founding Foresight Law + Policy, Reg practiced law for over a decade with two national law firms, and served as telecommunications, technology, and privacy counsel for U.S. Senate Commerce Committee Ranking Member Bill Nelson of Florida, and as a telecommunications and technology advisor to former Senator Bob Kerrey of Nebraska. Reg received his J.D. from the George Washington University Law School in Washington, D.C. and his bachelor’s degree from Cornell University in Ithaca, New York. He is a member of the Washington, D.C. and Virginia Bars, and the International Association of Privacy Professionals and the Federal Communications Bar Association. Jeff Mao joined Common Sense Education in the fall of 2014. He provides strategic consulting to states and districts on the effective implementation of digital learning programs. Prior to joining Common Sense Education, Jeff served as the Learning Technology Policy Director for the Maine Department of Education. In that role, he provided leadership and education technology policy support to four Commissioners of Education, and he was directly responsible for the Maine Learning Technology Initiative (MLTI). He oversaw all aspects of the program including vision, implementation, policy, professional development, procurement and contract management. Jeff has keynoted international events sponsored by UNESCO, World Bank, InterAmerica-Development Bank, and the Korean Education and Research Information Service. He served on the Board of Directors of the State Educational Technology Directors Association for six years including two as Chair of the Board. Common Sense Media named him Educator of the year in 2012, and SETDA named him Leader of the Year in 2013. Bo Morris is senior legislative assistant in the Office of Congressman Jared Polis (D-CO), where he advises the Congressman on education, labor, workforce, civil rights, and health care policy. Previously, Bo worked as an education policy research assistant at the Center for American Progress. He is a graduate of Samford University in Birmingham, Alabama, and holds bachelor’s degrees in political science and journalism. Steve’s passion is finding ways to intelligently and intentionally leverage technology to increase the effectiveness of teachers and maximize the personalization for learners. Steve has dedicated his career to advancing the conceptual development and implementation of high-value technology solutions for K-12. It is Steve’s hope that his passion for serving learners and his background in technology, product development, strategic planning, and business development will enable him to create systemic, positive change in learning opportunities for all children. Steve’s consulting background and educational technology R&D experiences focus on bringing insight to competency-based and universally designed learning communities. Sigrid Olson of Montpelier, Vermont, has been an educator for the past twenty-five years, focusing extensively on work in curriculum, instruction, and assessment. A native Floridian, Sigrid has lived in Vermont for fifteen years. In that time she developed the PK – 12 Social Studies Grade Expectations and was the first social studies specialist at the Vermont Agency of Education after a 17-year gap. She served as a technology integrationist for the Vermont AOE, during which time she coordinated the learning Network of Vermont, a school-based videoconferencing system used by over 120 schools and educational sites around the state, and project-managed the development of an online collaborative tool for educators. She currently leads the Personalized Learning team at the AOE, focusing on the implementation of Act 77 which requires all Vermont students in grades 7-12 to have a Personalized Learning Plan. She is currently a member of the New England Secondary School Consortium, a group that focuses specifically on high school transformation, and serves as the consortium’s Vermont liaison to the League of Innovative Schools. She also serves on the CCSSO Personalized Learning and Equity committee and runs the Vermont Presidential Scholars program. Not able to ever leave her first love of social studies education behind, she served as President of the Vermont Alliance for the Social Studies in 2017, and was proud to host a conference featuring Vermont’s response to the Syrian refugee crisis. Ashley Palelis is the Computer Science Specialist at the Florida Department of Education. She works with content specialists in the Department as well as teachers, district personnel, and administrators throughout the state. Ashley recently graduated with a Master’s Degree in Instructional Systems and Learning Technologies from Florida State University. Prior to working at the Florida Department of Education, Ashley taught third and fourth grades and physical education at an elementary school in Tallahassee. 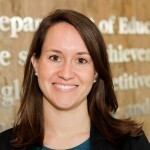 Abigail Potts is the NASBE’s director of college, career, and civic readiness. Potts brings over 10 years of experience in federal and state education policy along with a passion for data and educational equity. She previously served as a research scientist at the US Department of Education’s National Center for Education Statistics (NCES). At NCES, she worked in partnership with the Office for Civil Rights (OCR) to administer the Civil Rights Data Collection (CRDC). The CRDC provides wide-ranging data on educational access and opportunity covering topics such as early childhood education, college and career readiness, resource equity, and bullying and harassment. Potts has also served as an independent consultant providing technical assistance and policy analysis and as a senior policy advisor within the US Department of Education’s Office of Elementary and Secondary Education working on assessment and accountability issues. Her first job in education was at the Council of Chief State School Officers (CCSSO) reporting on education indicators and state education policies. Potts attended public school in Alexandria, Virginia, and currently resides in Alexandria’s Del Ray neighborhood. Previously, Dr. Ramírez served as the Acting Director for both Migrant Education and School Support and Rural Programs in the Office of Elementary and Secondary Education. Dr. Ramírez joined the U.S. Department of Education in 2006, when she was appointed group leader for the discretionary grants team, which plans and coordinates the High School Equivalency Program (HEP), College Assistance Migrant Program (CAMP), and the Migrant Education Even Start (MEES) program. A daughter of migrant workers and a former migrant worker herself, Dr. Ramírez left the fields to serve in the United States Army Reserves. She financed much of her college education through the GI Bill and began her career as an educator in 1992, first as a middle and high school teacher in English and English for Speakers of Other Languages (ESOL) in Texas, then serving as an assistant principal and principal. In 2004, Dr. Ramírez took on the challenge of opening the Lubbock Independent School District’s first charter campus, the Ramirez Charter School. She successfully led all aspects of the new school, from writing and evaluating grant applications, to selecting and training a new staff, to building an effective learning community for students and staff. Born in Chicago, but a true Texan at heart, Dr. Ramírez received her B.A., M.Ed., and Ed.D. degrees from Texas Tech University. She is an alumna of an Executive Leadership program at the John F. Kennedy School of Government at Harvard University. Dr. Ramírez enjoys cycling, hiking, and writing. She currently lives with her husband and two children in Alexandria, Virginia. As the Program Manager of Microsoft Airband Initiative, Melissa is responsible for increasing access to the internet and off-grid energy within unconnected communities from around the world. Microsoft’s strong culture of humanitarian support and civic engagement inspired Melissa to create MentorNations’, a youth-led digital literacy movement aimed at transforming the lives of the underserved via access, skills, and utilization of technology. As a PhD candidate in International Business, her research focuses on the tie between digital inclusion and the economic empowerment of women and girls. She holds two master’s degrees in supply chain and finance, and completed her undergraduate degree at Missouri State in International Business Management and Spanish. Avril A. Smart, Ph.D., joined the Alliance in March 2017 as research and engagement manager for Future Ready Schools® (FRS), for which she will provide leadership on the planning, design, and analysis of research that measures the impact of FRS. In addition, her work will explore the intersection between digital equity and personalized learning. Prior to joining the Alliance, Dr. Smart was a research scholar at the William and Ida Friday Institute for Educational Innovation where she specialized in research, evaluation, and policy analysis and worked on several mixed methods studies focused on innovations in teaching, learning, and leadership, including initiatives at the local school and district levels. Dr. Smart’s work also emphasized the role of for-profit and nonprofit educational service agencies that provide effective and complementary instructional support outside of school. Dr. Smart holds memberships in several professional organizations, including American Evaluation Association, American Educational Research Association, Society for Community Research and Action, Association of Black Psychologists, and Society for the Psychological Study of Ethnic and Minority Issues. She earned a bachelor of arts degree from North Carolina Agricultural and Technical State University and master of science and PhD degrees in applied social and community psychology from North Carolina State University. Since 1988, Kriss Stewart’s role with the South Carolina Department of Education has been to coordinate the Instructional Materials Adoption Program and to facilitate the vetting of instructional materials by teachers and content area specialists for State Board of Education approval. Kriss has been an active member of State Instructional Materials Review Association (SIMRA) for the past 15 years. Shannon Glynn Thomas is the Director of College and Career Ready Standards at the Council of Chief State School Officers (CCSSO). In this role, she leads the Council’s work to uphold the fidelity and intent of the Common Core State Standards and promote sharing and collaboration across states and national organizations with regard to college and career readiness. Shannon leads CCSSO’s work on high-quality instructional materials and aligned professional development, managing a network of seven states that are working to increase access and use of standards aligned, high-quality materials. She also manages a network of Chief Academic Officers and Chief Talent Officers and oversees work related to standards aligned instruction in the early grades. Shannon has worked extensively in education policy at the federal, state and local level. Prior to joining CCSSO, Shannon worked for Congressman Ron Kind, serving as an education policy legislative assistant and as an associate at a small policy firm managing education non-profit clients. DeLaina Tonks has been involved in education since 1991 and has been the director at Mountain Heights Academy, the top-rated digital school in Utah, since 2009. She also taught high school French and Spanish and worked as an instructional designer in Upper Arlington, Ohio for over a decade. She is a 2014 “Best of State – Principal” winner and was named as one of Utah Business’s “30 Women to Watch.” She is scheduled to graduate with a PhD in Instructional Psychology and Technology from Brigham Young University next year. She also holds a Master of Arts in Second Language Acquisition from the Ohio State University and a Bachelor of Arts in French and Spanish Teaching from BYU. She is passionate about leveraging technology’s promise to improve education. Donna Trane is in 9th grade and she lives in Uintah Basin Utah, in a little town called Myton. She has attended Mountain Heights Academy for two years. She enjoys the flexible schedule because it allows her to focus on dance, singing, acting, violin, and riding horses. In 2016, she and her team placed second in the state in the e-cybermission science contest. Kyana Trane is in 9th grade and lives in the Uintah Basin in Utah. She is currently in her second year at Mountain Heights and participates in a variety of extra-curricular activities such as dance, violin, singing, acting, drawing, and riding horses. In 2016, she and her team placed second in the state in the e-cybermission science contest. John Windhausen, Jr. is the Executive Director of the Schools, Health & Libraries Broadband (SHLB) Coalition, a diverse coalition of community anchor institutions, broadband companies, foundations (such as the Gates Foundation) and public interest groups. Mr. Windhausen also represents a variety of non-profit and commercial organizations through his consulting firm, Telepoly Consulting. In prior years, he served as President of a telecommunications trade association in Washington D.C., as senior counsel to the United States Senate Commerce Committee working for Senator Hollings (SC) and Senator Inouye (HI), and as staff attorney at the FCC. Mr. Windhausen currently serves on the MiCTA Board of Directors. Mr. Windhausen graduated from Yale University and the UCLA School of Law. Sarah Young provides leadership as Digital Teaching and Learning Coordinator with the Utah State Board of Education, and was previously the K-12 Science Specialist and the STEM Liaison for Utah. As the Coordinator for Digital Teaching and Learning, Young works with a dynamic team to plan, develop, promote, implement and evaluate programs in digital and personalized learning. This includes administering state and federal grants, implementing and monitoring state and federal legislation, and providing technical support in the area of current research-based practices. Young is actively engaged in roles working with K-12 Computer Science for All, Open Education Resource Development, and Competency-based learning for the state of Utah.